Since the partial U.S. government shutdown has been resolved for at least the next three weeks, the 1 February 2019 proposal submission deadlines for the NRAO and GBO Semester 2019B Calls for Proposals are unchanged. The assessment of submitted NRAO and GBO proposals and the time allocation processes for Semester 2019B would likely be delayed if further U.S. government closures occurred. We are hopeful that additional closures will be avoided and will keep you apprised of the NRAO and GBO operations status. 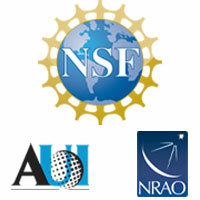 The 2020 Astronomy and Astrophysics Decadal Survey (Astro 2020) Call for White Papers has been published by the National Academies of Sciences, Engineering, and Medicine. To assist with coordination in the multi-wavelength community – with emphasis on radio-millimeter-submillimeter wavelengths – the NRAO has created a website to compile and broadly disseminate white paper topics, ideas, and submissions, particularly those relevant to a next generation Very Large Array. Astro 2020 white paper submissions will be open from Monday, 7 January 2019 (12:01 a.m. EST) through Tuesday, 19 Februray 2019 (5:00 p.m. EST). Please visit the National Academies website for additional information. Note that this deadline may be extended. A decision regarding an extension will be announced by 5 February. Registration and abstract submission are now open for Radio/mm Astrophysical Frontiers in the Next Decade. The deadline for submitting oral abstracts is 18 March 2019 and the discounted registration deadline is 6 May 2019. Space is limited, so register today! This workshop will review the astrophysical frontiers identified in the Science White Papers submitted to the Astro 2020 Decadal Survey. A particular focus will be on those science frontiers that demand observations at centimeter and/or millimeter wavelengths across all Astro 2020 thematic areas. A broad range of innovative ideas and approaches will be described, and this workshop will allow those ideas to be explored in view of the current and forthcoming facilities, including the next generation Very Large Array (ngVLA). The program will be designed primarily around contributed presentations highlighting science frontiers and potential observations with the ngVLA. Such observations will additionally be discussed in the broader context of multi-wavelength and multi-messenger astronomy. Contributions from early career researchers will be especially welcomed. The ngVLA will proceed into a detailed design and development phase in 2020. The ngVLA Science Advisory Council and the National Radio Astronomy Observatory (NRAO) aim to ensure that the ngVLA will be capable of making the measurements required to fulfill the community’s vision for radio wavelength astronomy over the next decade and beyond. For this workshop, we anticipate there being a modest amount of travel support for students and those in need, upon request. Please visit the conference website for additional information. The NRAO is pleased to announce the opening of registration for the 7th VLA Data Reduction Workshop, which will be held 7-18 October 2019 in Socorro, New Mexico, USA. Please visit the Workshop website to register and for more information. Note that space is limited, so please register early. The main goal of this Workshop is to assist observers with the challenges of Very Large Array (VLA) data reduction posed by the increased flexibility and complexity of the instrument. We will provide lectures on various topics and allow participants to reduce and image their own data while local expert staff members are available for consultation. This is an advanced Workshop and, unlike our summer Synthesis Imaging Workshops, is not intended for those who are new to radio interferometry. Prior experience with AIPS, CASA, or MIRIAD is required. As we will be using CASA as our main data reduction package, a working knowledge of it would be helpful. Unlike previous VLA data reduction workshops, this event will span two weeks: The first week will include both lectures and dedicated time for data reduction and imaging; and the optional second week will be devoted primarily for data reduction and imaging of your own data. Socorro is served by the airport in Albuquerque (75 miles north of Socorro). This Workshop will overlap in time with the International Albuquerque Balloon Fiesta, which draws many visitors to New Mexico. Therefore, we urge you to make your travel plans (airline and rental car) as early as possible. We look forward to welcoming you to NRAO and Socorro next October! The ngVLA Science Book has been published via the Astronomical Society of the Pacific (ASP) Monograph series. All first-authors should be receiving their complimentary copies in the mail shortly. Additional hardcover copies are available for purchase on the ASP website. While nearly all chapters were submitted to the arXiv during the week of 15 October 2018, published versions are now available on ADS. We again thank all who have contributed to this exciting collection of transformative science and encourage all to review the chapters on ADS. With nearly 90 chapters (850+ pages) from 285+ authors, this volume highlights key areas of astrophysics that are ripe for major breakthroughs and underscores the broad U.S. and international support for pursuing a next generation Very Large Array (ngVLA). While this published volume will serve as a critical snapshot for the ngVLA project status and a vision for the ngVLA transformational science, we envisage this science book as a living document that will be periodically updated through the initiation of construction. 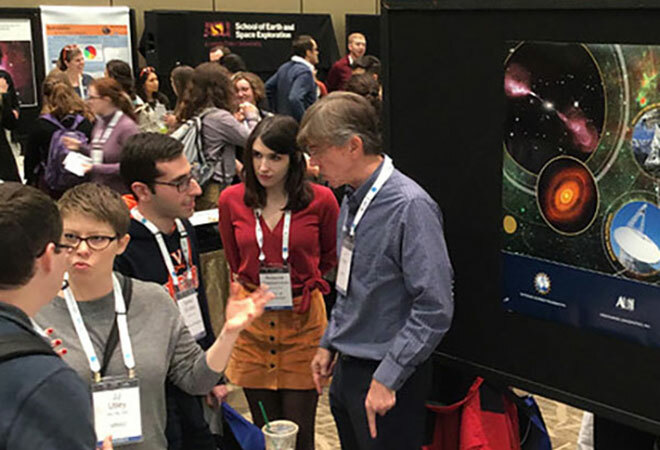 We would like to thank all participants that helped make our Special Session on Theoretical Advances Guided by Radio-Millimeter-Submillimeter Arrays at the January 2019 AAS meeting in Seattle a tremendous success. The scientific content presented at both the oral and poster sessions was truly inspiring, and certainly led to both sessions being extremely well attended. All talks and posters can be found online. The ngVLA Project hosted a Special Session on the design and development of the facility at the 2019 URSI National Radio Science Meeting in Boulder, Colorado. The Special Session featured talks from NRAO engineering leads and collaborators including the National Research Council of Canada, Arizona State University, Brigham Young University, and Texas Tech University. This Session included ten talks spanning from the antennas to the correlator, with forward-looking development into new asynchronous clocking and Radio Frequency Interference mitigation techniques. 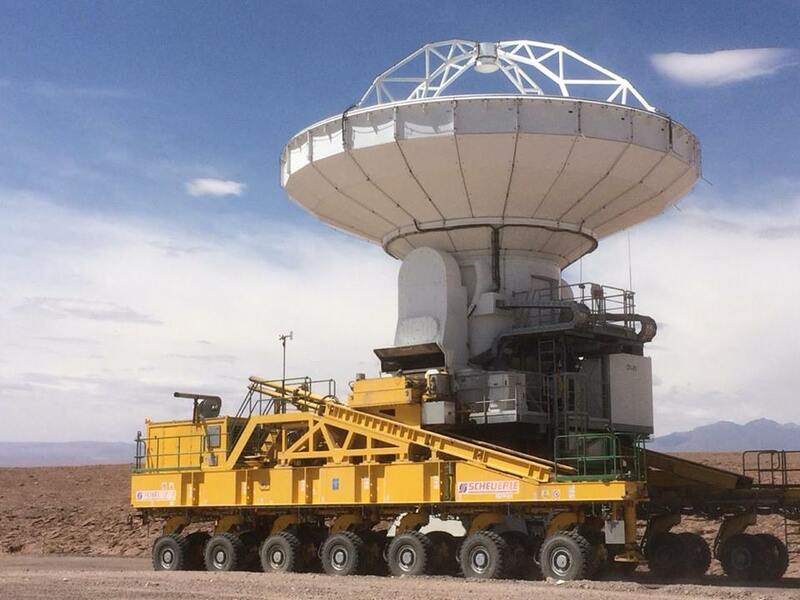 ALMA is in its shrinking cycle as it contracts to configurations more suitable for summertime observing. ALMA is now in configuration C43-2 (2.3 arcsec beam at 100 GHz, 15m to ~300m baselines) and will shrink further before expanding again as weather improves in March. Observations in Band 7 in configurations C43-9 and C43-10. Solar observations in Band 7 in configurations C43-1 and C43-2. Solar observations in one additional configuration (C43-4) in Band 3. North American antenna DV01 passed its acceptance tests in Feb 2009. After a decade at the Array Operations Site, this antenna returned to the Operations Support Facility for its first major maintenance in Jan 2019. In addition, spectral scans will become a standard mode. Observations in Band 7 at baselines longer than 5 km will become a standard mode as long as there is expected to be a suitable phase calibrator within 5 degrees of the science target. Finally, the data rate limitation from previous cycles will be significantly relaxed so that Principal Investigators will be able, for example, to set up high spectral resolution windows in long baseline configurations that were previously hampered due to high data rates. A Call for Proposals for ALMA Development Studies was released 3 December 2018. The deadline for proposals is 1 May 2019 for funding during Fiscal Year 2020, depending on the U.S. federal budget process. We welcome any member from within the North America ALMA Operations Partnership to submit a proposal to investigate a potential ALMA upgrade (hardware, software, or advanced techniques). Particular attention should be given to ideas which may address the goals elucidated in The ALMA Development Roadmap, ALMA Memo 612. Proposers are requested to submit a Study Proposal Notice Of Intent by 15 March 2019. 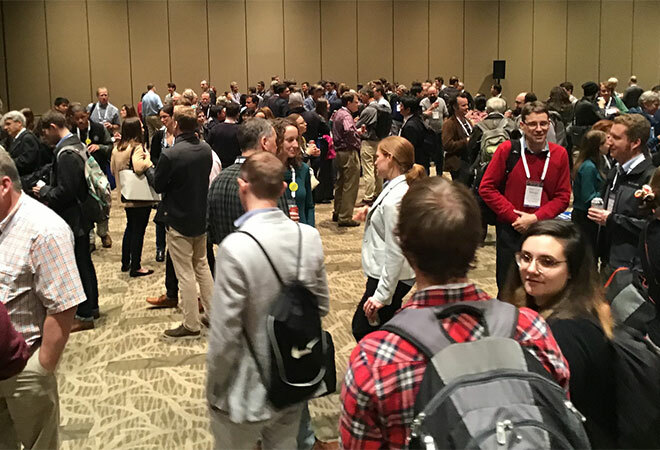 A well-attended ALMA Special Session was held at the 233rd American Astronomical Society meeting 6-10 January 2019 in Seattle. The North American ALMA Science Center (NAASC) is excited to announce the 2019 ALMA Ambassadors. The Ambassadors program is at the core of the NAASC efforts to reach out to potential proposal Principal Investigators, and we are grateful for their contribution to the community. We are looking forward to meeting with the Ambassadors in February at the National Radio Astronomy Observatory (NRAO) headquarters in Charlottesville, Virginia, and to working with them in the preparation of events at their home institutions. Training will include topics related to ALMA proposal writing, including interferometry basics, ALMA science capabilities, recent ALMA headlines, use of the Observing Tool, and guidance with speaking on these topics. The postdocs will then host a local proposal preparation workshop at their home institution – similar to an abbreviated version of Community Day and NRAO Live! events from previous observing cycles – in advance of the Cycle 7 ALMA proposal deadline in April 2019. Use the arrow buttons to navigate through the gallery. More photos from the AAS are available on our recently launched NRAO Instagram account. 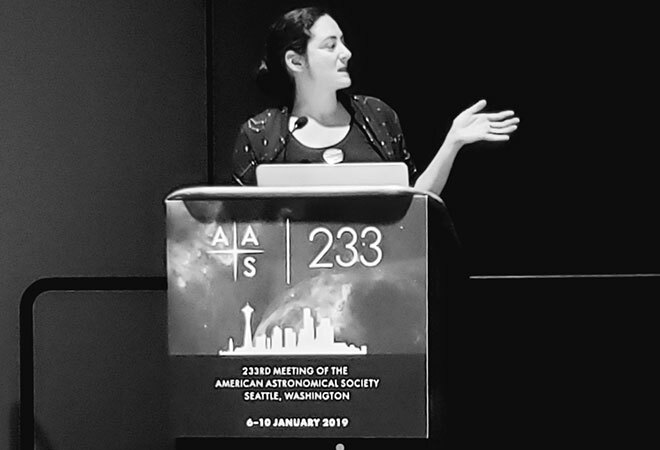 NRAO Assistant Scientist Amy Kimball presented one of six talks at a NRAO-organized Special Session titled The Very Large Array Sky Survey on Thursday afternoon, 10 January. Dr. Kimball’s talk was titled Extra-galactic Science with the Very Large Array (VLA) Sky Survey. (Credit: Lisa Locke). The NRAO Town Hall attracted 250+ astronomers on Tuesday evening, 8 January. After an opening reception, NRAO Director Tony Beasley briefed the attendees on the status of science, science operations, and development programs at the NRAO. (Credit: Brian Kent). 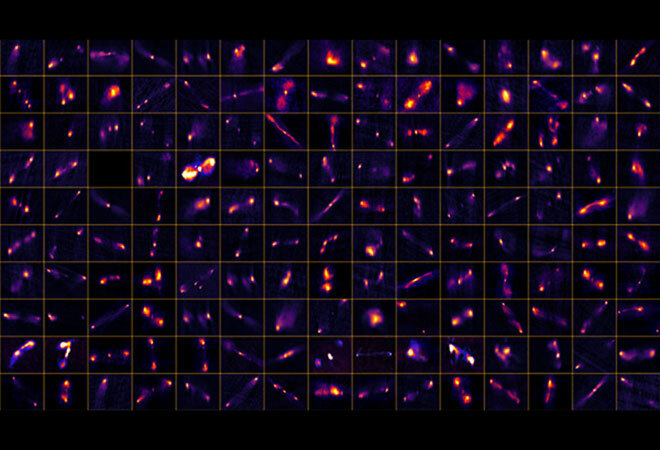 A sample of QuickLook images from Epoch 1 of the Very Large Array Sky Survey (Credit: Brian Kent). 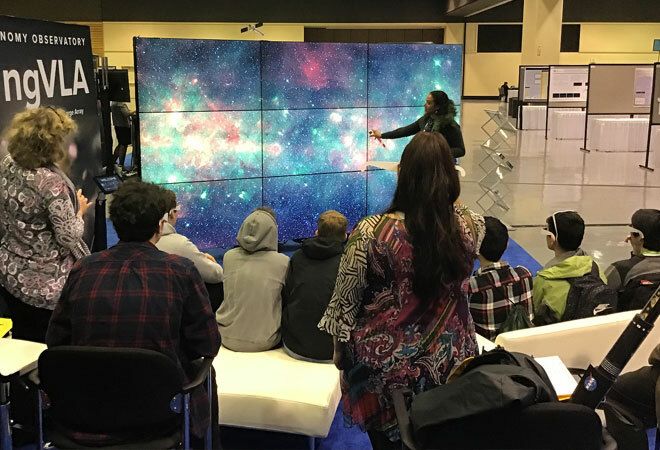 NRAO STEAM Education Development Officer Jessica Harris speaks with one of the many groups of Seattle-area middle and high school students who visited the AAS exhibition hall at mid-day Wednesday, 9 January. Registration for the First CTA symposium is now open. Participants can register online. Your registration will be confirmed by the workshop secretary as soon as the registration fee has been received. The workshop registration fee is 300 euros before 20 March 2019, and 350 euros after this date. A special rate of 200 (250 after 20 March) euros is available for students. The theme for the First CTA Symposium is Science Opportunities with CTA and will take place at the historical Teatro Duse in Bologna 6-9 May 2019. The meeting specifically addresses the larger multi-wavelength / multi-messenger communities and aims to set up new channels of communication with those communities. It will feature a combination of invited and contributed talks. The preliminary programme is available on the symposium webpage. or any other topic connected to the scientific possibilities of CTA. Submit your abstract online. Please make your submissions comprehensible to a broad astrophysical audience as some of the attendees may be unfamiliar with the specifics of your field. The deadline to submit abstracts is 20 February 2019. The Scientific Organising Committee (SOC) will consider the submission for inclusion in the preliminary programme and will notify the authors whether their contribution has been selected for an oral/poster presentation by 15 March 2019. Stefan Funk, on behalf of the SOC. Head of ALMA Department of Science Operations: The Joint ALMA Observatory (JAO) is seeking a senior science manager, with extensive experience, to lead the Department of Science Operations (DSO), which is responsible for the science operations of the international ALMA radio astronomy observatory in Chile. This is an outstanding opportunity to lead the scientific operations of the most ambitious ground-based observatory operational in the world today, delivering unique scientific data to a world-wide user community of approximately 4,000 professional astronomers. Assistant Scientist or Software Engineer I-III: The NRAO is seeking to recruit a full-time (at-will) scientific staff member or Software Engineer I-III (as appropriate for educational qualification) to join their CASA team. CASA Software Engineers design, develop and maintain the code base for radio interferometer data reduction and analysis. About this month's photo: Grote Reber was interested in a broad range of topics beyond radio astronomy – including meteorology, lava flows, botany, archaeology – and was often ahead of his time in his thinking. In the late 1970s, concerned about the growing energy crisis and the increased use of fossil fuels, he built an energy-efficient house in Tasmania. Reber wrote about the house into which he had recently moved in his March 1981 letter to Canadian radio astronomer John Galt: "So far, it has been quite pleasant. However, proof of performance will be next winter." The house did perform extremely well, and in 1990 Reber received an energy efficiency reward from the state government and the Hydro Electric Commission. 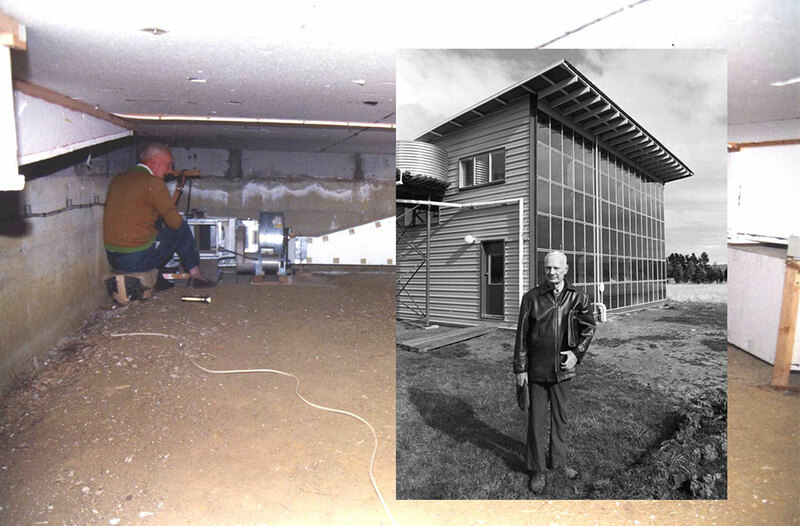 In this photo, Reber stands in front of his new house in 1981, and adjusts his basement ductwork in 1992.